AVS Image Converter supports the command line mode, therefore allowing you to automate the processing of your images. This opportunity can be indispensable in case you have to constantly work with a large number of different files. correct digital photos adjusting their brightness, contrast etc. convert images into a multi-page PDF document. 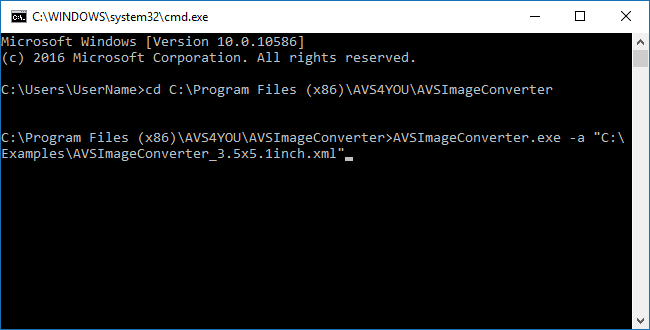 This guide describes how to resize multiple images using AVS Image Converter in the command line mode. Put all the image files you need to resize into a folder on your computer HDD. For your convenience, some XML file examples are included into the AVS Image Converter installation and can be found in the program installation folder (by default it is C:\Program Files\AVS4YOU\AVSImageConverter\examples or C:\Program Files (x86)\AVS4YOU\AVSImageConverter\examples for a 64-bit version of Windows). Note: the \AVSImageConverter\examples folder also contains a number of .BAT files. For a quick demonstration of the command line conversion opportunities, you can launch any of them by double-clicking the file. The <conversion fileFormat=""> tag allows to set the desired output format. In the example above, the PNG format is specified, but you can also convert your images into JPEG, PDF, GIF, TIFF, BMP, TGA, RAS. The <formatSettings> tag allows to specify some output format parameters. E.g. for the PNG format, you can specify if you want to merge input images into an animated image or not, setting the <animated> parameter to true or false correspondingly. The *.jpg value specified for the <filter> tag in the example above allows to upload JPG files only. The *. * value allows to upload all the files stored in the folder. To use files of several specified formats only, set the values separating them with a semicolon: *.jpg;*.jpg etc. The <outputFolder> tag is used to set a path to the folder fot output files. If necessary, you can also set parameters for resizing and renaming files, adding a watermark or applying effects. Where <profiles>ResizeProfile</profiles> is a name of the XML file with resize profiles (without extension). It can be either ResizeProfile or UserResizeProfile (if custom profiles have previously been defined). The necessary XML file can be found in the AVS Image Converter installation folder: \AVSImageConverter\profiles\ResizeProfile.xml or \AVSImageConverter\profiles\UserResizeProfile.xml. <GUID>E8F80ACD-8EFF-4aad-A709-C606F6B67749</GUID> is a GUID of the necessary profile (it should be taken from the ResizeProfile.xml/UserResizeProfile.xml file). E.g the GUID specified in this example corresponds to the Photo 3.5x5.1 inch (9x13 cm) 300dpi preset. The <autostartConversion> tag is used to specify if you want to start the conversion process immediately as the program launches. Set it to false if you just want to launch AVS Image Converter with all the specified parameters without starting the conversion itself. Finally, specify some general parameters like the conversion priority, actions that must be accomplished after conversion etc. Please do not forget to replace the paths to input files/folders provided in our examples with your own ones. When specifying paths to files and folders using the <file>, <folder> and <outputFolder> tags, you can use environment variables like %PROGRAMFILES%, %MYPICTURES% etc. In the example above we use the %MYDOCUMENTS% variable that specifies the "Documents" / "My Documents" directory of the current user. For more details on the tags and environment variables used in the AVS Image Converter XML files please refer to our Appendix section. You can also find all the necessary information in the CommandLineKeys.txt file located in the AVS Image Converter installation folder. AVSImageConverter.exe is the converter executable file name. C:\AVSImageConverter.xml is the full path to the XML file you've created. Please note that you need to replace the path to the XML file provided in the command example with your own one before executing the command. The file path must be enclosed in double quotes. AVS Image Converter starts with all the conversion parameters specified in the XML file, and the conversion process begins immediately (if the <autostartConversion> parameter is set to true). Once the conversion is over, the AVS Image Converter window closes automatically and the assigned output folder with the converted files opens (but you can specify another final actions in the configuration XML).